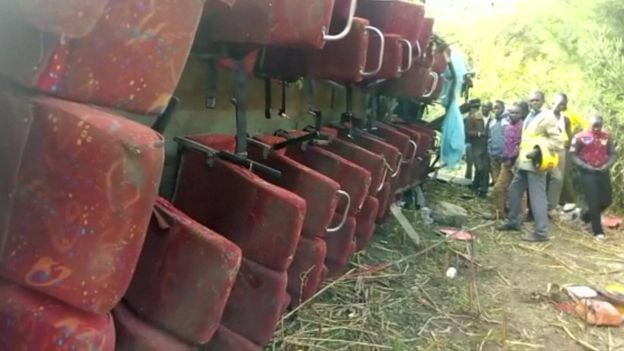 At least 50 people have been killed after a bus travelling from the Kenyan capital Nairobi to Kisumu, in the west, veered off the road, police say. "The roof of the bus was ripped off," a local official said. "It is unfortunate that we have lost 51 people," Kenya's police chief Joseph Boinnet told Capital FM radio. An eyewitness described hearing "a long hooting sound, then a screech that was followed by a bang and loud screams," Kenyan newspaper Daily Nation reported. The newspaper added that a number of people had been taken to a local hospital for treatment. Highway roads in Kenya can be notoriously dangerous and the World Health Organization (WHO) has ranked Kenya as one of the world's worst countries for road safety. In 2016, several vehicles were engulfed in flames in a crash involving an oil tanker in Naivasha, Kenya, which killed dozens of people.